Leinster and Ireland lock Malcolm O'Kelly is a legend of the modern Irish game. O'Kelly made his bow for the Leinster senior side against Northern Transvaal during the 1994-95 season before winning regognition at Ireland U21 level. He then made his full international debut against New Zealand in 1997, O'Kelly would go on to become the bedrock of the Ireland pack. 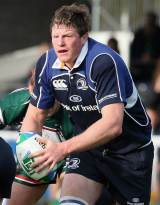 In February 2005 O'Kelly broke Mike Gibson's record for Ireland caps, although his mark has now been surpassed. O'Kelly featured for Ireland at three World Cups, in Wales in 1999, Australia in 2003 and France in 2007. He was a tourist with the British and Irish Lions in 2001 and was selected for his second tour in 2005, only to miss out with injury. O'Kelly's final Test cap came as a replacement against Italy during Ireland's Grand Slam run in 2009 and in 2010 he announced his retirement from the game prior to a Magners League semi-final against Munster.